Lyndsay Faye has been reading Sherlock stories since she was 10. "I loved them," she says, "and then I never actually stopped reading them. Lacking the Internet, it wasn't until I was a teenager that I discovered there was such a thing as pastiches and fan fiction out there. Then I read as much of the non-canonical material as I could find--probably thousands of stories at this point, no joke." 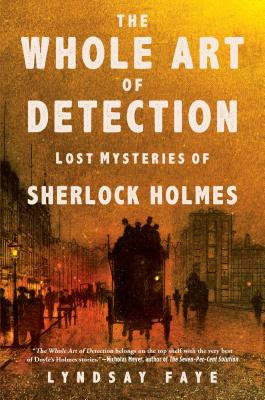 The 15 stories in Lyndsay Faye's The Whole Art of Detection will prove purely delightful for fans of the original adventures of Sherlock Holmes and Dr. Watson. With two entirely new stories, and 13 others culled from previous anthologies and magazine contributions, the collection stands as a tribute to Faye's way with words and witticisms, both of which combine to reinvigorate Holmes and Watson (as well as their surrounding casts of miscreants, assistants and unassuming bystanders). Like Doyle, Faye brings mystery and adventure to Holmes and Watson in various settings. At times that is 221B Baker Street, and at others it is a hospital, a wine shop and even (most entertainingly, for those who know Holmes's unsocial ways) an elite garden party. These variations allow Faye to explore myriad aspects of Victorian London, with its seedy underbelly, political intrigues and aristocratic traditions. No less diversity is found in the timing of Faye's stories, which span Holmes's pre-Baker years through his time with Watson, past his return from the dead and to the pair's later capers. What stands out most completely in The Whole Art of Detection is Faye's ability to capture the style, tone and approach that made original Doyle stories so enduringly captivating, and maintain that style throughout clever new adventures. These capers are as entertaining as the originals, but even more wonderful is the new depth Faye brings to the characters--and their complicated and exceptional friendship. I received a copy of this title for review & interview preparation from the publisher. Opinions my own. If you don't already subscribe to Shelf Awareness for Readers, you can sign up here for a twice-weekly dose of readerly goodness in your inbox, with the occasional contribution from yours truly mixed in among many an excellent review from a group of wonderful reviewers.